First of all, what are tapas? It is thought that originally in the wine-making regions of Andalucia una tapa (the word “tapar” in Spanish means“to cover”), in the form of a small plate or lid was placed over glasses of wine to keep fruit flies away. Titbits of food were then placed on the dish to be eaten with the wine. How I so love the Spanish that it is unacceptable that a fly ends up in your drink, but it´s fine if it lands on the accompanying snack! Other stories suggest that tapas were invented by a bar owner in Seville, who decided to put a cover (tapa) over his guests´ glasses of wine, using a slice of bread to keep out flies. He later put a piece of ham or cheese on top, so that his customers could have a bite to eat with their drink. Either way, the idea spread, so that nowadays the types of food served as tapas are limitless. 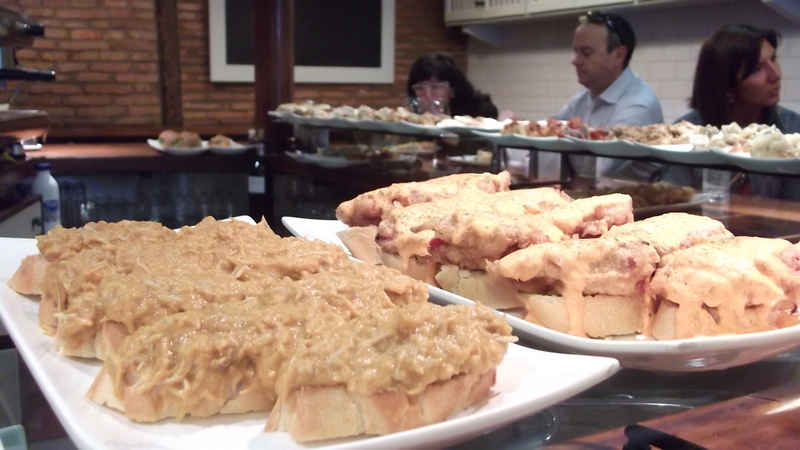 Most Spaniards don´t drink alcohol without a tapa and many bars provide them free of charge. The Spanish equivalent of “fast food” is usually displayed in refrigerated glass units on the bar and served in small terracotta glazed dishes. Some examples of the type of tapas normally available include gambas (whole cooked prawns in their shells), boquerones (fresh anchovies in olive oil, vinegar and garlic), chorizo (spicy Spanish sausage), albondigas (meatball…often in a creamy almond sauce), queso (cheese…often manchego), habas con jamon (broad beans with ham), ensalada rusa (Russian salad) or just a few olives. Your choice of tapas is usually accompanied by a small piece of crusty bread which helps to counteract the adverse effects of the alcohol through drinking on an empty stomach. In many establishments, if you stand at the bar along with the locals you will be given one tapa free with each drink you buy. That’s right …. free food! 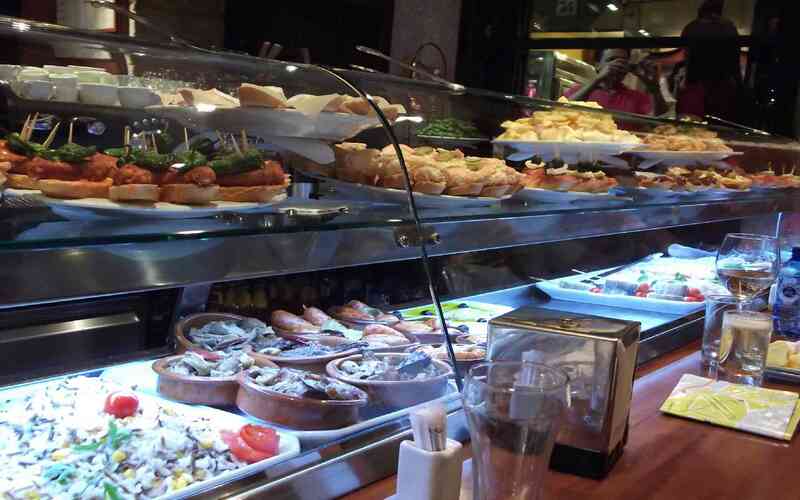 Should you choose to sit away from the bar, you can pay for a tapas or two (usually for one euro or less in this part of Spain), or opt for a larger serving known as a ración (ration) or medio ración (half ration). This is a great way to eat a variety of dishes, and a pretty sociable activity as groups generally tend to share their dishes. The food is generally very good, even in remote villages around the Axarquia. Where is your favourite tapas bar? Which tapa do you choose, time and time again? This entry was tagged Andalucía, culture, East of Malaga, Europe, Food, life, lifestyle, Malaga, Spain, Tapas. Bookmark the permalink. There are all kinds of tapas, I know, and I’ve liked almost all I’ve tasted. But most of all I love tortilla. I love it so much that —- because you can’t get it readily in rural New England — I’ve actually learned to make it. Yes, and we are going to have to come and try them, very soon! 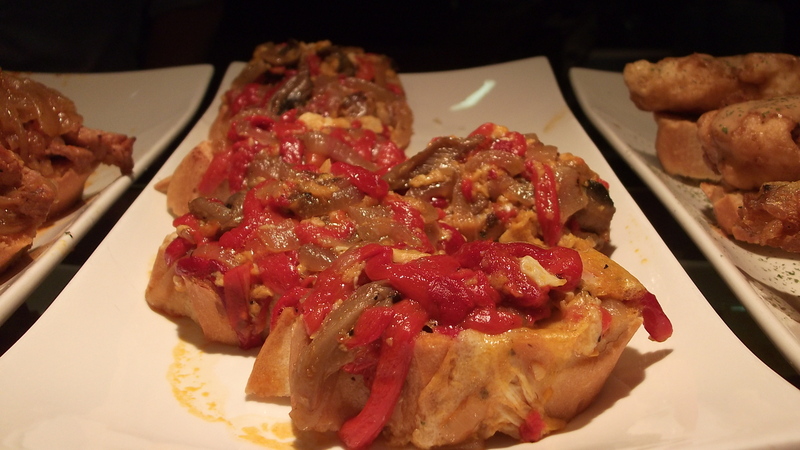 Tapas – not only delicious but sensible too! Can´t knock that! We have great tapas here in Salobreña, all free. One of my favourites is El Rey de Boquerones, fabulous fish tapas..omg talk about fantastic. One of the best side benefits of tapas, is the fact that you don’t get quite so light headed while drinking. Smart.